Whilst understaffed wards and surgeries turn to well-connected private sector agencies to fill the gaps created by Cameron's health 'reforms', the NHS's own in-house recruitment agency is to be sold off, it has emerged. Last week it emerged that Jeremy Hunt plans to sell off the National Health Service in-house recruitment agency, NHS Professionals, before the election. The agency was established in 2000 to reduce the amount spent on recruitment fees. It has 40,000 workers on its books, providing bank nurses to 65 NHS trusts. It’s the Department of Health’s second attempt to privatise the agency - in 2010 they failed to find a buyer. This time they have given the sell-off to the same bank that ran the Royal Mail privatisation, suggesting another gone for a song sell-off. Despite a turnover of about £450million, the agency operates with low profit margins, with most funds going to staff pay rather than commission. Selling off the state staffing agency will merely raise the cost of temporary staffing for trusts. Temporary staff costs have already risen 20% between 2011 and ’13, a Nursing Standard investigation found. Last year, Jeremy Hunt spent £1.4bn on NHS redundancies - then spent £3.9 billion filling the gaps with temporary agency staff in the NHS – tripling costs in just 3 years. 7,000 frontline clinical staff have been axed since 2010, the Department of Health has admitted. Understaffed wards turn to private firms that supply agency nurses and doctors. These firms have pocketed millions in profits over the past year – charging up to £1,000 per shift. Meanwhile, owners of these companies are earning up to £2million a year. The biggest winner, private equity firm Blackstone, saw revenue across its medical companies hit £226million last year. There’s mayhem in GP practices too, highlighted this week by RCGP Chair Maureen Baker. Patients are waiting longer for appointments, partly because of the amount of extra administration Cameron’s Health Act loaded on to GPs. Hiring permanent staff would save billions of pounds, but that doesn’t play to the Secretary of State’s agenda. “It is basic common sense that if you want to save money, the last thing you should do is create a situation where you spend more. But that is what this Government has done with its ­senseless cuts. And who are these recruitment agency bosses? At least at the top end, there are some leading Tories turning a tidy profit from back-filling the gaps Hunt is creating all over the NHS. Conservative MP Nadhim Zahawi is paid £2,917 a month for seven hours work as non-executive director of recruitment firm SThree - a firm staffing new Clinical Commissioning Groups. SThree has devoured £2.6million from the NHS in 10 months by filling vacancies caused by Tory health reforms. It’s “Real Staffing” agency, part of it international health business, has netted it at least £1.4 million across 8 London CCGs for just 40 staff. The Government claimed the CCGs would enable doctors and other clinicians to take local decisions. But GPs are abandoning commissioning roles like lemmings, unable to cope with the extra bureaucracy. Instead, as critics predicted, an increasing number are being staffed and run by private companies. Zahawi’s MP expenses claims include £5,822 to ‘heat his mansion and stables’ and 31p for paper clips. He was admitted to Cameron’s inner circle last October when he joined the No 10 Policy Unit. Headhunter firm Odgers Berndtson has been heavily involved in vetting key personnel into the drastically restructured NHS, including the replacement of current NHS Chief, David Nicholson. Its Chair and CEO is one Baroness Virginia Bottomley (who just happens to be the cousin of Jeremy Hunt, a past Secretary of State for Health herself, and also a funder of the Conservative Party). Research by Social Investigations has uncoverd how Odgers has been involved in key appointments in the Department of Health, the Care Quality Commission, and the North-West London Commissioning Support Unit busy dismantling of chunks of Charing Cross, Hammersmith, Ealing and Central Middlesex hospitals. Councillors are barred from voting with a ‘prejudicial interest’ and can only debate with permission from fellow councillors, but Westminster rules allow MPs and Lords to vote on legislation even if they have a financial interest, a conflict banned at local council level. I’ve written before about how easy it is to track the links between Cameron’s infamous kitchen suppers and Tory Party donors who have links to private health companies. Since I wrote these words the NHS has been under legislative onslaught - the Health & Social Care Act, Section 75, Clause 119. The reforms that they protested in both the Commons and the Lords were ‘nothing to do with privatisation’. But the evidence is now with us. From the recruitment agency cash-ins, to the sale of the blood plasma service to Bain Capital. And not forgetting the handing of a further £1.5 billion in NHS contracts to Tory Party donors. Circle Health has landed £1.36billion worth of health service work (including the contract to takeover the first privatised NHS hospital, Hinchingbroke) after several ­of its investors gifted about £1.5million. Labour’s recent research shows Circle Health’s parent company, Circle Holdings PLC, is owned by a series of hedge funds, all of whom were founded by major Tory party donors. Lansdowne Partners (29.2% stake) was founded by Sir Paul Ruddock, who donated £692,592 to the Tories. Odey Asset Management (14.8% stake) founder Robin Odey donated £220,000. Invesco Perpetual (28.7% stake) was set up by Sir Martyn Arbib, who donated £466,330. BlueCrest Capital (5% stake) was set up by Michael Platt, who has donated £125,000. Since the election, Circle Holdings’ profits have gone up from £64.6million in 2010-11 to £170.4million in 2011-12. 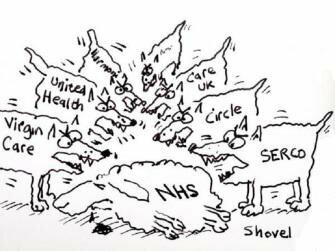 They are now in the final running to takeover the second NHS hospital that may be privatised, George Elliott in Nuneaton. Another giant, Care UK, has contracts worth another £102.6million. Its chairman John Nash was made a peer after donating £247,250. Care UK’s healthcare revenue soared by 63.2% from £189.7million a year in 2012 to £309.5million in 2013 after being handed a string of NHS deals worth £62million. Their services include the troubled 111 phone service, clinics, and many prison health care contracts. So much for all that capital, long term workers in Doncaster whose contracts have been transferred from the local authority to Care UK, have been striking at the threat of losing up to 50% of their pay despite working long unsocial hours. Just like the nurses forced out and re-hired on insecure, poor quality agency contracts - these workers and their patients are losing out to boost the wealth of those who can afford to donate to the Conservative party.